We hope to include other biographical sketches here as they are submitted to us. Write up your ancestor and share the information (and a picture if you have one) with everyone. WILLIAM R. GRANT, Supreme Secretary and one of the Directors of the American Friendly Society of Urbana, was born in London, England, July 16, 1862. 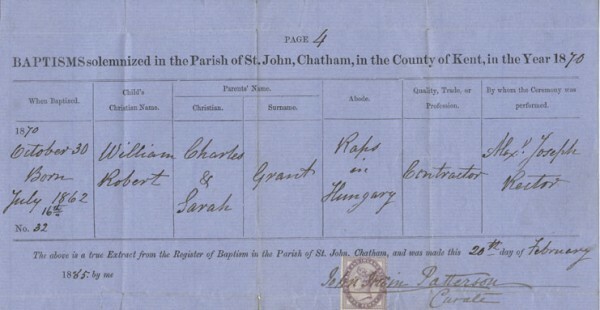 His parents were Charles and Sarah (Harris) Grant, natives of England and of Scotch and Irish extraction, respectively. The father was a railroad contractor and built the first railroad in Hungary, Roumania and the Balkan principalities. He was later appointed contracting engineer for the Egyptian Government. He was educated in Greenwich College, London, and died in Egypt, in March 1886, at the age of fifty-four years. His wife's death occurred in Roumania in 1902, when she was sixty-two years old. His father was a midshipman on the Bellerophon, under the command of the famous Lord Nelson. With another midshipman and five sailors, forming a prize crew, he was intrusted with the duty of taking a captured French ship to England; but during the voyage the French crew mutinied, and killed all of the prize crew except William R. Grant's grandfather and two sailors, who succeeded in navigating the ship to England. For this service three medals, two and a half inches in diameter, were awarded them in commemoration of their service. The two sailors pawned their medals, which were melter for the gold. The medal of Mr. Grant's grandfather is the only one of the three now in existence, and on it is engraved a full bust portrait of him, together with a brief history of the event. William R. Grant was the fourth of six children, five of whom are living. He was educated in Little Queen Street College, London, from which he graduated in 1882, receiving the degree of Mechanical Engineer. He then traveled through Europe, and was subsequently appointed Civil Engineer and Meteorologist for the European Commission of the Danube River, his headquarters being at Sulina, where he remained for three years. He was then employed by the Anglo-Egyptian Dredging Company, as Civil Engineer in dredging the River Nile, and was thus engaged for two years. Coming to Urbana in 1888 he accepted a position as mechanical engineer and draftsman for the "Big Four" Ry. Co., which he retained for five years. He next became State and supervising deputy for the Modern Woodmen of America, with headquarters at Philadelphia, a position he held for eight years. At the end of this period, he organized the American Friendly Society, of Urbana, a sick and accident benefit association, the chief officers of which are Urbana citizens. Mr. Grant was elected County Surveyor of Stutsman County, N. D., for one term. Socially, he is a member of the Masonic order, belonging to the Blue Lodge and Chapter, of Urbana, and is Super-Excellent Master in Urbana Council. He is also affiliated with the Knights of the Maccabees and the Modern Woodmen of America. Politically, he is an adherent of the Prohibition party. 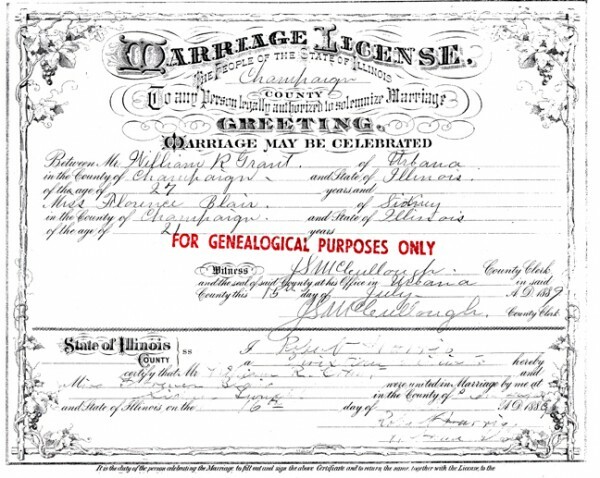 Mr. Grant was married on his birthday, July 16, 1889, to Florence Blair, a native of Champaign County, and a step-daughter of Nelson Samson, of the same county. They have two children -- Helen Winifred and Ruth Margaret. Religiously Mr. Green is a member of the Episcopal Church, while his wife adheres to the Methodist faith. William Robert Grant, 70 years old, longtime resident of Urbana, died at his home, 602 West Illinois Street, at an early hour Wednesday morning, after a long illness due to a complication of diseases. The funeral will be held at 3 o'clock, Friday afternoon, from the Renner Funeral Home. Services will be in charge of Rev. Sidney A. Guthrie, assisted by Rev. Olin L. Sherburne. Urbana Lodge 157, A. F. & A. M. will have an emergency meeting at 2:30 o'clock, Friday afternoon, for the purpose of attending the services. Burial will be made at Woodlawn Cemetery. The deceased was a son of Charles and Margaret Harris Grant and was born in London, England, July 16, 1862. He spent his early life in London, but while a young man went to the region of the Danube, where he was engaged in engineering work. Later, he did the same work in the region of the Nile. He came to Urbana, about 47 years ago to visit his uncle, the late Rev. Robert Harris, then pastor of the First Christian Church of Urbana, and decided to remain here. 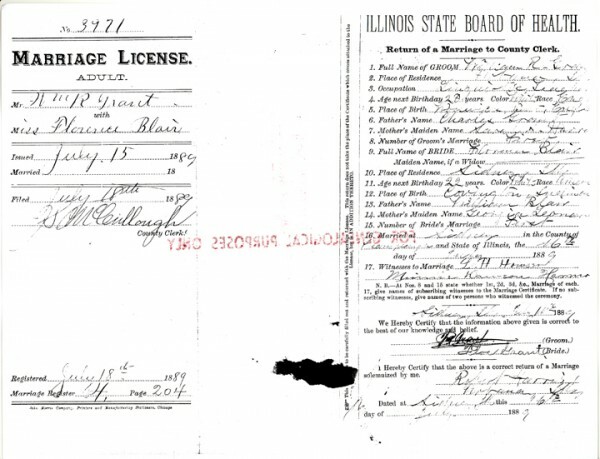 On July 16, 1889 he was married to Florence C. Blair, of near Urbana. Two children were born to them, Helen, wife of Clyde H. Parr, of Chicago Heights, who preceded her father in death and Ruth, wife of E. E. McCoy, of Elgin, who with his wife, survive. There is also a grandson, Robert E. McCoy. For many years, Mr. Grant was engaged as a draftsman with the New York Central Railway, then known as the Big Four. Later, he entered insurance work, and at the time of his death was state manager for the Masonic Protective Association of Worcester, Mass. Mr. Grant was a member of the First Methodist Church of Urbana, and all of the Masonic Orders of Urbana, as well as Mohammed Temple of Peoria. Sherry Havener wrote the following biography and provided the image. Questions on content and sources should be directed to Sherry Havener at jhsh@comcast.net or 505 Burgener Dr Mt Zion, Il 62549. CCGS edits are in brackets [ ]. Major William R Haddock was my Great Great Grandfather. He was born in Watertown, Jefferson, NY on Oct 24, 1822 and died in Champaign, Illinois on Feb 27, 1879. His father was a blacksmith and put all of his children through schooling at the Black River Institute in Watetown [Watertown], NY. He learned the trade of printing at the age of 12. Got a law degree but printing was his passion. He formed a colony in NY and went to Minnesota to find ground for this colony to live. That area is known as Minnisota City [Minnesota City], Mn today. Upon moving to Mn his first wife died with 45 days of arrival from Malaria [malaria]. William along with some other settlers moved to Iowa after so many people died so quickly. William Haddock started the first newspaper in Anamosa, Jones, Iowa in Oct 1852. He sold that paper and moved to Waterloo, Blackhawk, Iowa in 1855. Shortly after arrival there his 2nd wife died. He then married his 3rd wife. Again he started another newpaper [newspaper] in Waterloo, Iowa. In 1861 he enlisted in the Civil War. When the War of Rebellion started William raised a company for the 12th Iowa Infantry Regiment in the fall of 1861. At the age of 39 years, William was appointed Captain October 29,1861, leaving his family at their residence in Waterloo, Iowa. He and his Regiment [regiment] took part in the capture of Fort Henry. At the battle of Shiloh he was reported MIA Apr 6,1862. He had been taken prisoner along with 150 officers and 2000 Privates [privates]. He and his fellow prisoners celebrated the 4th of July in Madison, Georgia at the Cotton Mill prison. In January 1863, the prisoners were exchanged and returned to their regiments. 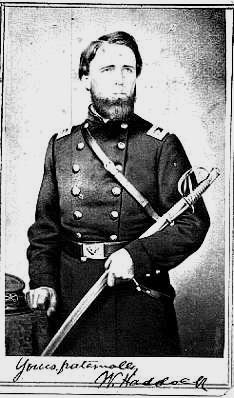 While in Vicksburg he was appointed Major of the 8th Iowa Cavalry on May 28,1863 by Governor Kirkwood of Iowa. Later assigned as Major for the 9th Iowa Regiment. He then was assigned to the 3rd Battalion 9th Iowa Cavalry and ordered to St. Louis, Missouri where time was spent in drilling. In the spring of 1864, he was ordered to Arkansas where they observed the movement of the Confederate Army. Involved in one engagement which was with General Shelby, near Brownsville station [Station], where some one hundred and fifty men were killed and wounded on both sides. He resigned on September 13, 1864 after spending three years in service. He and his family located in Effingham, Illinois and in October, 1864, he started the Effingham Register, a weekly Republican journal, which he continued until 1872. He was a delegate to the Cincinnati Convention, and actively assisted in the nomination of Mr. Greeley, an old friend. Major Haddock left Effingham Illinois for Champaign, Illinois in August 1872. There he purchased the "Illinois Democrat"[.] Several years later, the paper was renamed "The Champaign Times". All totaled he started newspaers [newspapers] in 4 different cities. In 1871, he built a three story opera house at a cost of $16,500. He had 3 sons and 2 daughters. Only 2 sons survived to adults and both of them became printers. Two of William's brothers became printers and both of their sons became printers. Major William Haddock had a brother named Dr George Channing Haddock who was a Methodist Preacher [preacher]. He wanted to serve in Sioux City, Iowa to fight prohibiton [prohibition]. He was murdered there. John A Haddock another brother wrote several books and also had his own newspaper. HARRY KING, a dealer in coal and feed, at No. 413 North Neil Street, Champaign, Ill., was born in Suffolk County, England, May 14, 1845, the son of Henry and Elizabeth (Borham) King. The parents were natives of England, and both died there. The father was a blacksmith by trade, but followed the occupation of farming for fifteen years before he retired. He died in 1900, at the age of eighty-two years, his wife's death having occurred in 1896, when she was about seventy-eight years old. Both were members of the Established Church. Harry King is the eldest of three children: the others being Bessie (Mrs. J. L. Clover), who resides in England, and Walter, a clerk in the American Car & Foundry Company, in St. Louis, Mo. The subject of this sketch received his education in St. John's College, England. Later he taught in two private schools in England, and also prepared students for Rugby College. In 1866 he came to the United States, and secured a position as steward in the Erie Hotel, at Dunkirk, N. Y., where he remained for six months, then moving to Xenia, Ill., where he engaged in house painting. He next went to Rantoul, Ill., continuing in the same trade, and them removed to Gibson City, where he was engaged in the grain business for three or four years. From there he went to Farmer City, where he married. Later he went to Indianapolis, Ind., and from there, in 1886, to Champaign, where he has since remained. In 1886, Mr. King entered the employ of Fred P. Rush & Co., and remained with them for fifteen years. Their old elevator was torn down in 1889. On August 7, 1900, he engaged in his present business, dealing exclusively in coal and feed, and has been very successful. In politics Mr. King is a Republican, and socially he is affiliated with the Independent Order of Odd Fellows, having passed all the chairs; has also been a member of the Encampment and of the Patriarchs Militant, and has served five times as representative in the Grand Lodge of Illinois. In religion he is a Presbyterian, his wife being a member of the Lutheran Church. 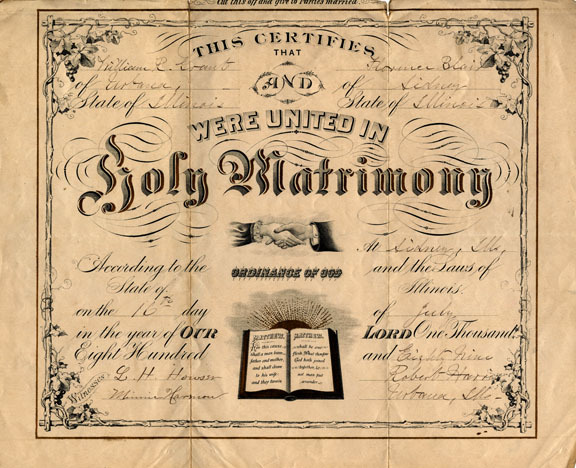 Mr. King was first married July 4, 1878, to Elvira Jane Gibson, a native of Illinois, and daughter of John and Mary Gibson, both of whom are deceased. Two children were born of this union-Charles W., who assists his father in business, and Henry H., who died when two years old. Mrs. King, who was a devout member of the Presbyterian Church, died January 31, 1888, aged thirty-three years. 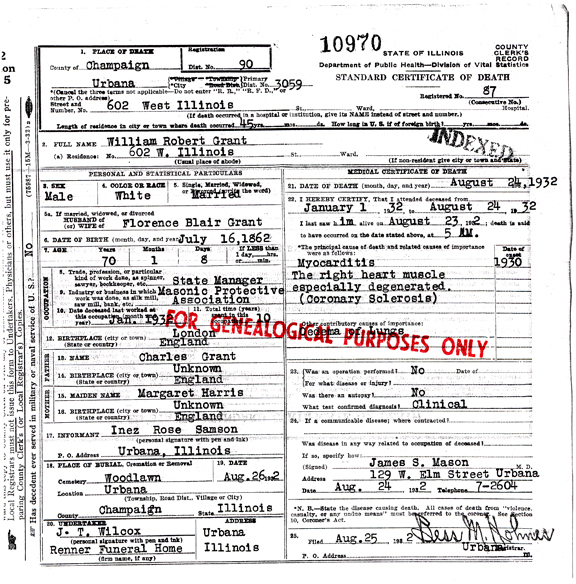 On December 23, 1891, Mr. King took, as his second wife, Mary Lavina Weidlein, a native of Henry County, Ill., and a daughter of Andrew and Sarah Weidlein, who reside in Geneseo, Ill. Of this union five children have been born, namely: Jessie May, Nellie Hazel, Laura Ivy, Florence Myrtle and Henry Weidlein.